The first readily available piece of information on the station's history begins with a piece entitled "Minutes of the meeting of the Promotion Staff of ... See more the Brown and White" dated December 3, 1946. The Brown and White is Lehigh University’s student Newspaper. Robert Lewison, of the promotion staff, "entertained a motion on behalf of the Radio Committee that 'the Brown and White construct and operate a campus radio station.' The motion was passed unanimously." The motion was passed on to the Board of Publications who studied the feasibility taking into consideration proposed budgets, sample programming schedules, a proposed constitution, staff positions and names of candidates to fill the positions, and plans for building the station. Under Bob Lewison's guiding hands, the committee wrote up a report on the proposed station. Their projected cost for the set up would be $3,233.00. If the University supplied the labor, the cost would be reduced to about $1,600. The money to start the station was proposed to come from the funds of the Brown and White, the Board of Publications, and, perhaps, Arcadia. In programming, the staff met and discussed the problem of records. "We found that several students on campus had very large collections and could also get records from collections of friends who had equally large collections. We were also promised the use of the records Tone musical society has on hand. This gives the station the use of approximately 10,000 records." Questionnaires were sent out to Lehigh Students in the form of "Frequency Data Charts." The students were asked to tune their radios "once a night to the 540 kc. to 700 kc. range for the next two weeks" indicating whether the frequency was clear, had static, was receiving code, had low (weak) reception of some station, or high (strong) reception of a station. 640 KHz was the eventual choice. The first organizational meeting of the station was held in Drown Hall in the offices of the Brown and White on December 17, 1946. By April 1, 1948, "Report on the status of WLRN; The Brown and White Broadcasting System" was published to explain the "delay in opening of operations and the broadcasting of programs to the university campus living groups." "The campus station has had many problems from the beginning," the report said. "The first of these was and still is money. The station has had to take steps to save every penny possible, in many cases at a considerable loss in time. The estimate of a commercial firm to install a studio and transmitting equipment was about $4,000. and as you can tell by the money allotted so far, we are doing the job for much less. When the idea of a campus station was first brought before the Board of Publications some estimates were made as to the possible minimum costs of equipment and studios necessary for a campus station. Since that time it has been necessary to increase the number of loans beyond the bare minimum figures due to increase in the prices of radio parts and because certain of the cheaper parts are not available and finally because of a change in the design of our set up...WLRN is almost ready to go up on the air. However, to put the station on the air properly there are no funds left in our account." Thus begins the true tradition of the Lehigh Radio Network, "Make It Do." It is quite possible that the network would not exist today if it were not for the electrical engineers who saved the network untold amounts of money and made tech station as sophisticated as it is. Equipment was first tested on March 19 and 20, 1948. "This test broadcast was very successful and the program could be heard all over campus. The special events staff presented Vice President Smiley, Coach Sheridan and some of the team members to the student body along with a complete description of the meet. Of course this was and has not been publicized as it was only a test broadcast." The history of WLRN in tech 1950's is so sparse that perhaps we're to believe the 50's was a do-nothing decade. Sometime in the 60's, WLRN gave birth to WLR. "WLR was organized to create and perfect a format that could be successfully employed on the FM station contemplated. WLR, then, if essential to the WLRN-FM of the future." The change in format, and the eventuality of FM, spawned a station with a completely different personality and outlet to the community. WLVR-FM officially went on the air following the FCC FM go-ahead at 11:30am on May 8, 1973. In this year, WLVR went FM, WLRN went cable, and WLVR went stereo cable. WLVR has made countless leaps and bounds since the 70's and now stands as one of the best radio stations in the Lehigh Valley. WLVR stands out as one of the very few college radio stations that is run predominately by its students. Run by a dedicated student and community staff, WLVR continues to grow both in size and popularity. The last bastion of truly FREE FORMAT radio in the country. 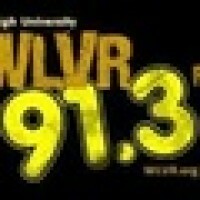 WLVR college and community radio strives to offer the alternative to the familiar!